Pendants 1" high, drop 2"
This pair is quite unique with colorful personality! 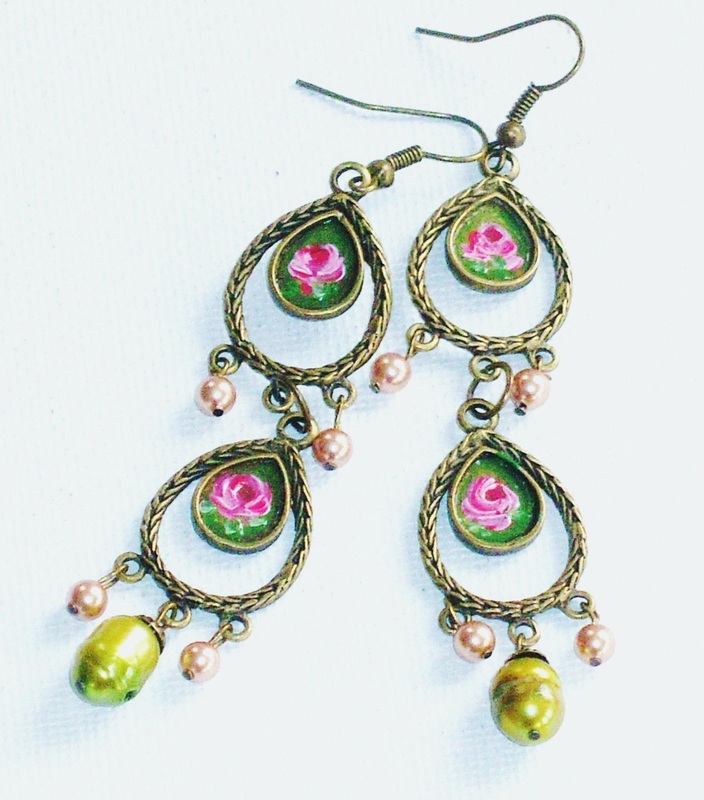 It features a couple of antiqued pendants with pretty painted roses and underneath swings lustrous pearls in olive green and pink rhubarb...under those I placed a pair of mother of pearl disc beads to complete the look! 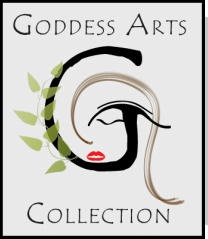 They are lightweight, so they will not only enhance your outfit, they are really comfortable! 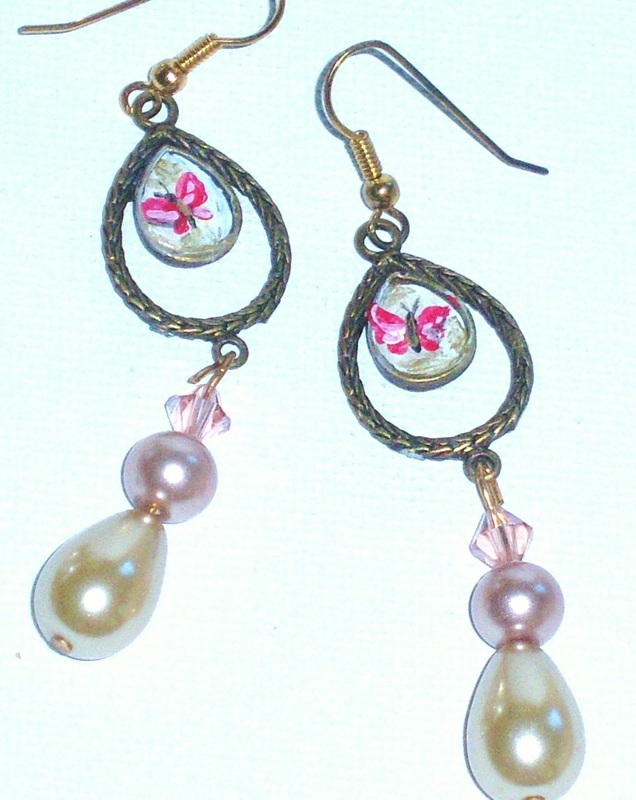 Antiqued Gold Earwires, Antiqued Gold Pendants 1", Genuine Cultured Pearls 2/8", 3/8", mother of pearl bead, drop 3"
Antiqued Gold Pendants 1" high, 1/2" wide, Swarovski Pearls( in satiny peach-pink) 1/8", Rice Pearls 3/8", drop 3 1/4"
MOD FLORALS Dangling earrings with a definite 60's vibe, featuring hand-painted floral designs with tiny Swarovski crystal rhinestone centers, on a pair of antiqued gold pendants and genuine turquoise and jade beads dangling beneath! Fun, colorful Boho style! Antiqued Pendants 1", Turquoise Beads 1/8", Jade Beads 3/8", drop 3"
ROSE DANGLES A pair of earrings with floral Boho flair! 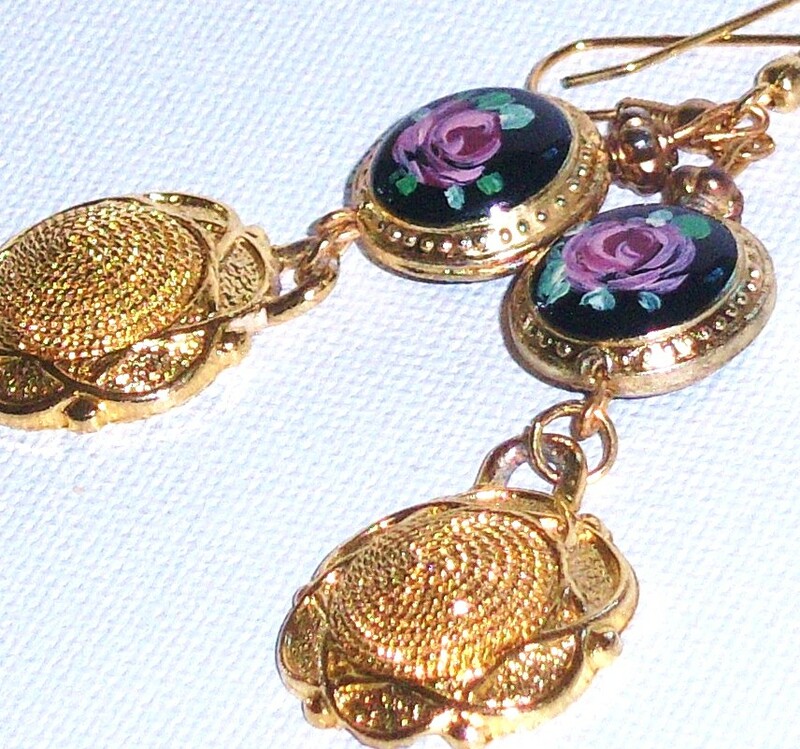 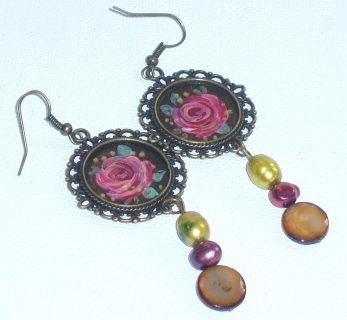 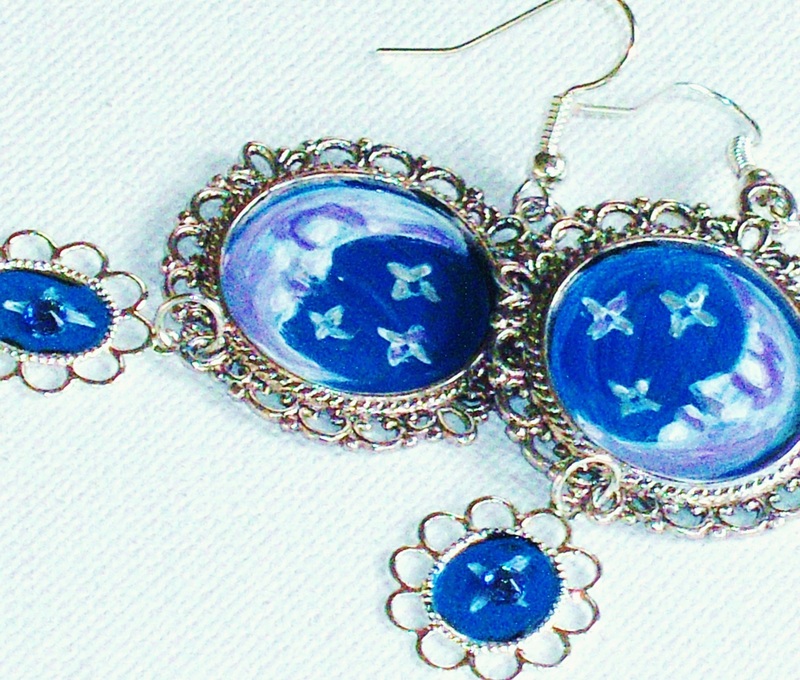 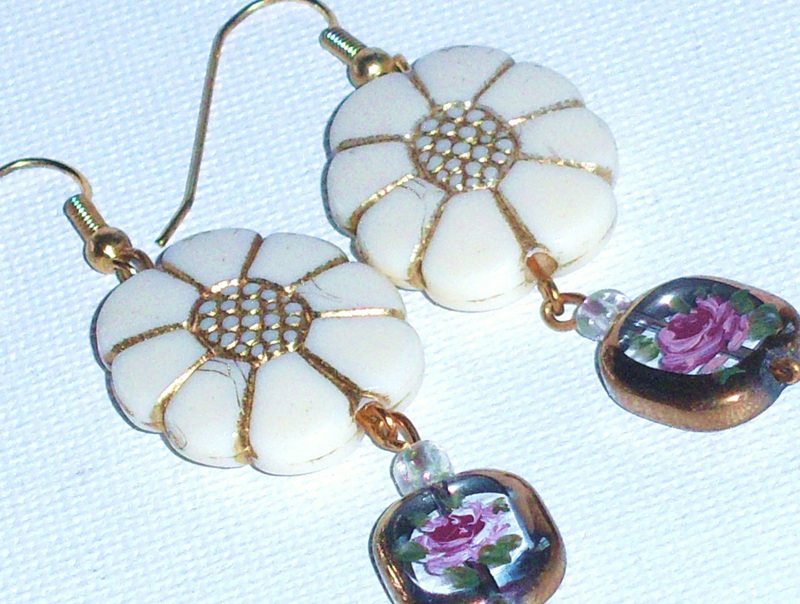 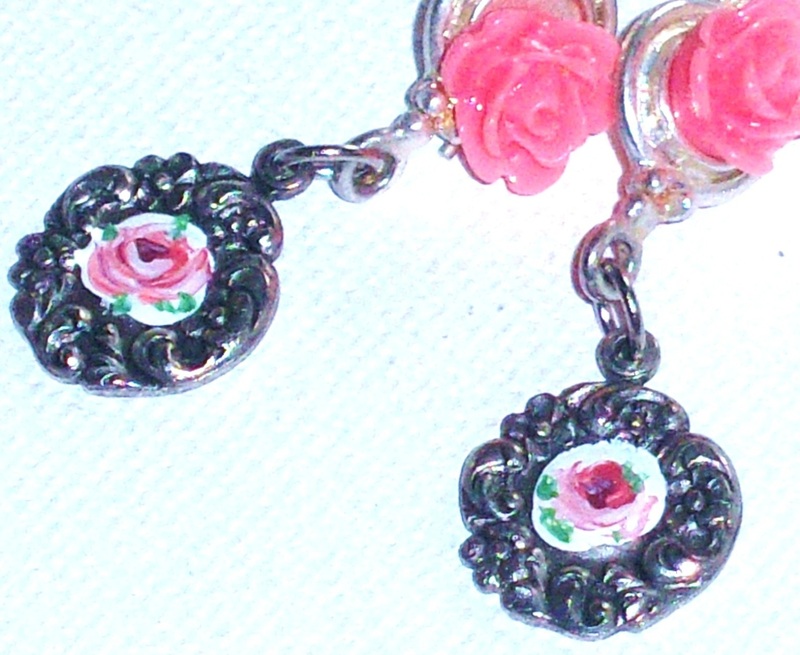 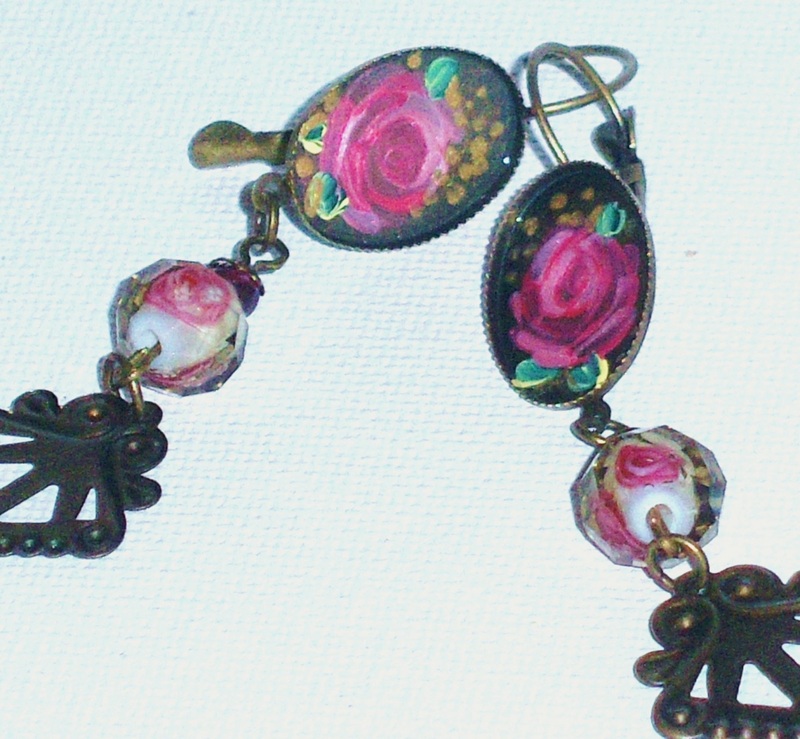 The hand-painted frames, glass rose-design beads,tiny garnet semi-precious beads, and the antiqued charms will dangle beautifully from your ears and add a floral feminine feel to your outfit! 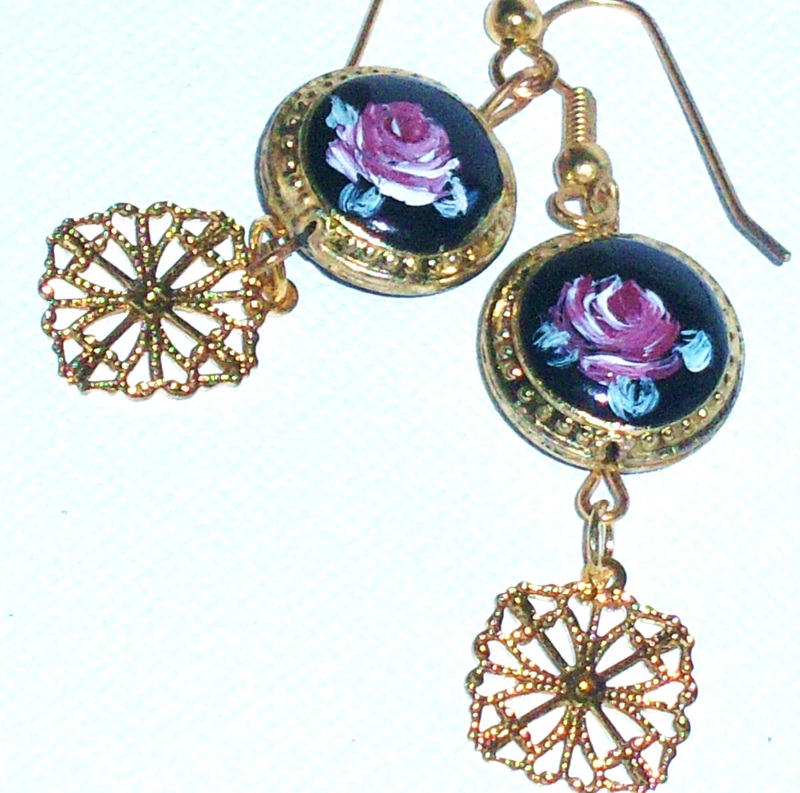 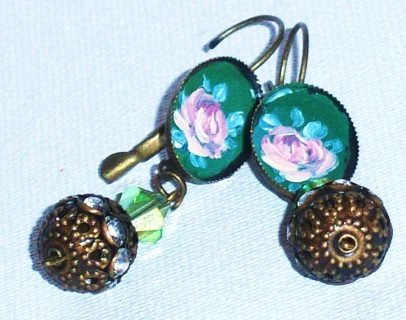 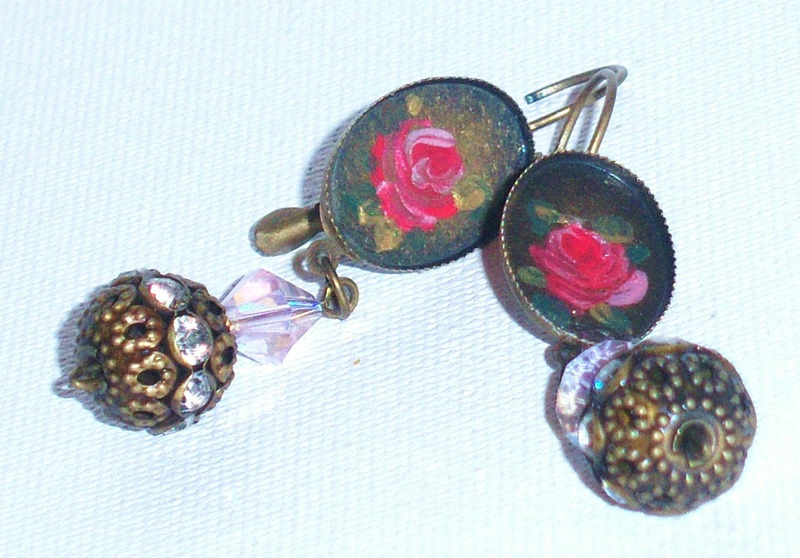 Painted frames 1/4", Rose beads 1/4", Antiqued Charm 3/4" drop 2 1/2"
PRETTY FLORALS A flirty and feminine pair of hand-painted earrings with a vintage Bohemian vibe in antiqued gold featuring pale pink crystal beads and rhinestone-encircled baubles that add eye-capturing sparkle as they sway! 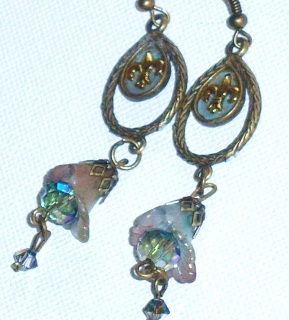 FLEUR DE LIS A pretty pair with vintage charm! I began the design by hand-painting a blue-green background onto the antiqued pendants and placing tiny fleur de lis charms on top. 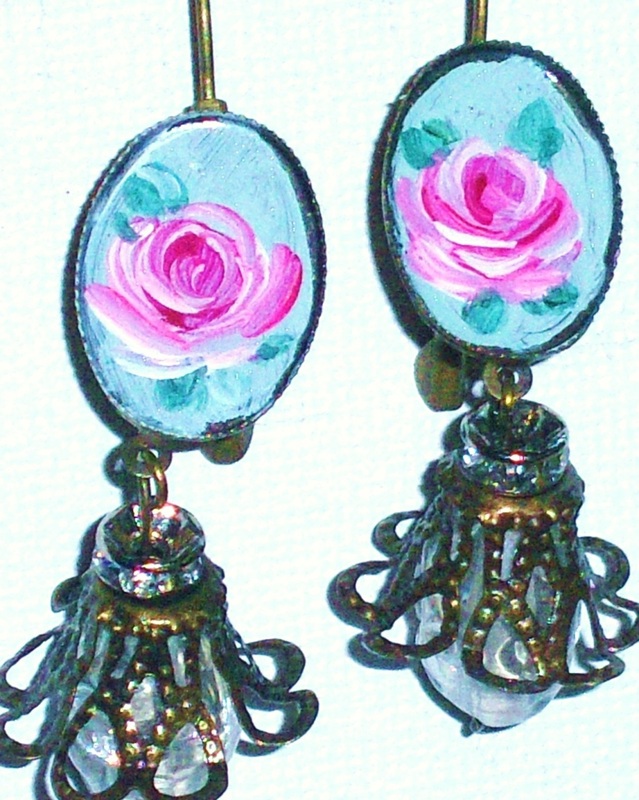 I then hand-tinted the lucite floral beads and added sparkling Swarovski crystal beads and antiqued bead caps...the result is a casual pair of earrings with just the right touch of shimmer! 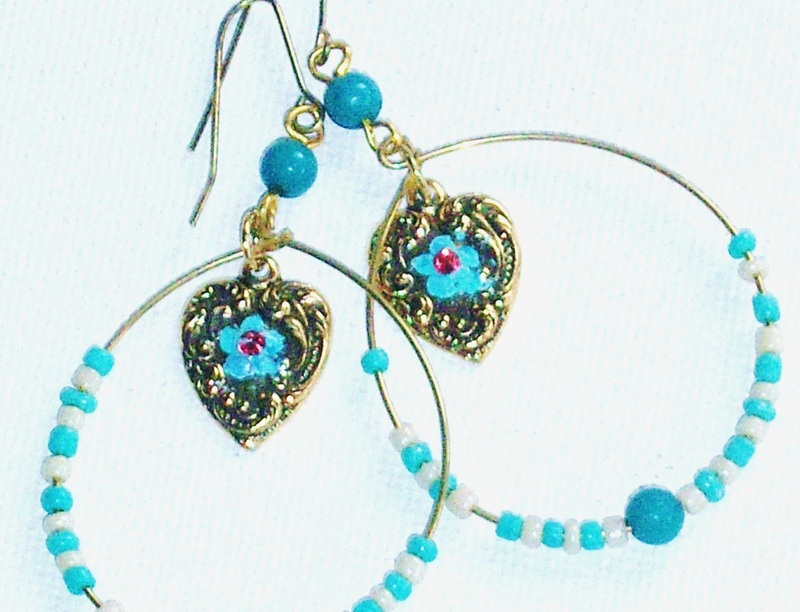 BEACHY BOHO This pair of one-of-a-kind earrings has relaxed, warm-weather style...They are girly-pretty with their hand-painted heart charms and turquoise-colored beads! 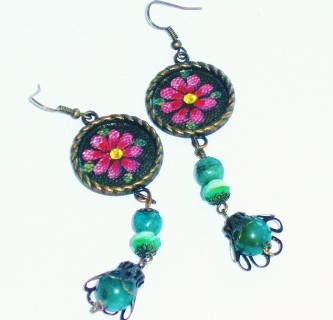 And they're super comfortable because they are lightweight so they won't be a drag on your ears! 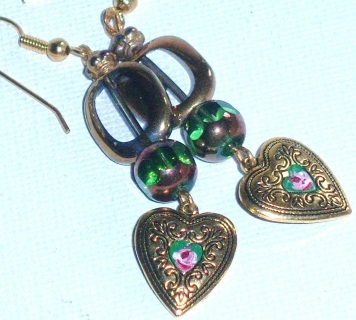 Gold-plated Earrings, Hoops 1 1/2" high, 1 1/4" wide, Heart Charms 1/2", drop 2 1/2"
Silver-plated Earwires, Silver-plated Pendants 1" and 1/2", drop 2 3/4"
60'S SWIRLS A mod pair featuring wood rounds painted lustrous pink, a swirled antiqued gold filigree cover, and shimmering pink beads above the dangling pendants! 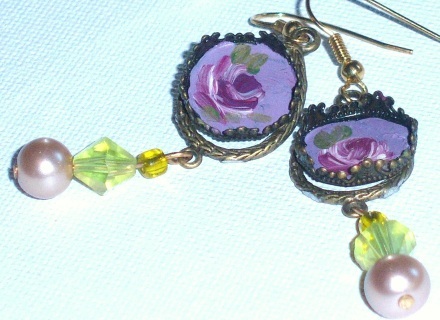 one-of-a-kind pair! 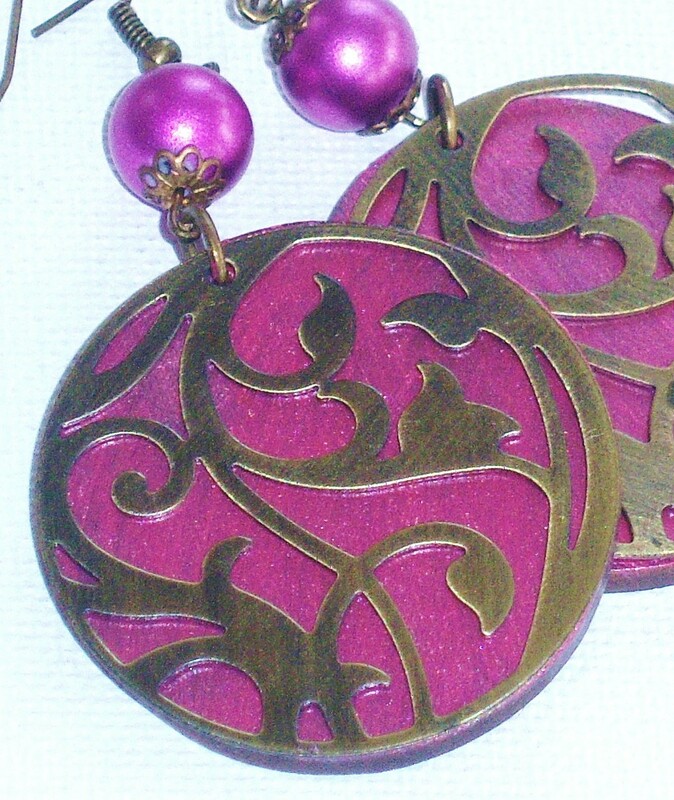 Wood Pendants 1 1/2", Pink Beads 3/8", Antiqued Gold Earwires and Overlay, drop 3"